Recent shorebird trend analyses indicate that many Western Hemisphere shorebird species are declining, but we do not fully understand why. The goal of the Arctic Shorebird Demographics Network (ASDN) is to conduct demographic analyses for several target species that will help determine the factors limiting their populations. The ASDN measures demographic rates like adult survival and productivity and other demographic parameters at various life history stages. This internationally coordinated effort includes 17 partners working in 16 camps across Alaska, the Canadian Arctic and Russia. It is led and coordinated by Manomet, U.S. Fish and Wildlife and Kansas State University. The project is designed to substantially increase our ability to address a wide variety of other science and conservation goals that can only be approached at a regional or global level, such as migratory connectivity studies that require work across the entire range of a species. Click here for a full list of network partners. Why do we need a demographic network in addition to the other ongoing shorebird monitoring programs? The existing large scale monitoring efforts developed under the Program for Regional and International Shorebird Monitoring (PRISM) provide critical information on population size and trend, along with accompanying environmental data to interpret the estimates. However, the existing programs cannot provide information on the mechanisms behind declines, and when shorebird populations are likely to be limited during the annual cycle. For example, poor reproductive success, or low juvenile or adult survival during migration could be limiting populations, but trend information alone is not sufficient to determine which of these factors managers should target to reverse population declines. Determining when shorebird populations are limited will have significant impacts on future conservation actions to address population declines. The group developed detailed field protocols to investigate demographic parameters as well as environmental variables at all of the study sites. We completed five years of intensive banding efforts for our target species, Semipalmated Sandpiper, Dunlin, Western Sandpiper, Pectoral Sandpiper, Whimbrel, Red-necked Phalarope, and Semipalmated Plover. In addition, as part of the Arctic Landscape Conservation Cooperative, we collected weather data, invertebrate abundance samples, and other environmental data to help determine causes of variations in nesting success over time. Multiple study years are needed to accurately measure survival of banded individuals, and also because significant year to year variation occurs in the demographic rates of shorebirds. We completed an intensive effort to collect baseline data from representative sites across the Arctic, and are analyzing those data and publishing results in many different manuscripts. Ongoing complementary projects include efforts to track migratory pathways of our target species so we can determine critical habitats and conservation priorities. Manomet’s Stephen Brown is the overall coordinator for the project, and supports group planning, communication and group funding efforts. Rick Lanctot of USFWS is the Science Coordinator and leads the design and development of field protocols and data analysis. Brett Sandercock of Kansas State University leads the group on study design issues and will lead the demographic analyses. River Gates works for both Manomet and USFWS on protocol development and Network coordination. Joe Liebezeit of the Wildlife Conservation Society and Paul Smith serve on the protocol development committee. 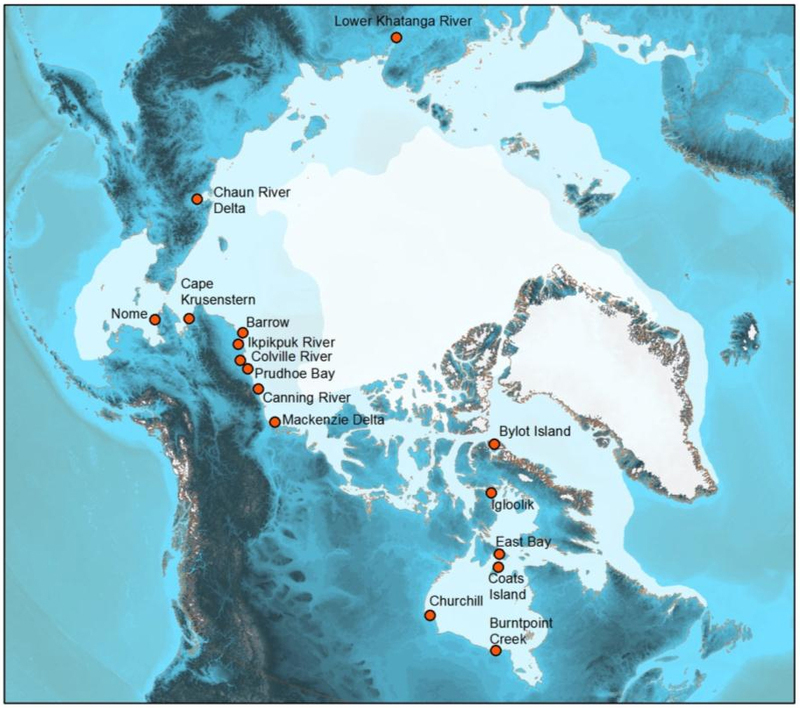 Below is a map showing the current research sites in the Arctic Shorebird Demographics Network. Click on the image for a larger version. Click on the thumbnail below or click here to view the ADSN Breeding Protocol. Click the name of each folder below to open the zip files.